The Celtics (15-13) look to take on the Chicago Bulls (24-7) in a rematch of last Sunday where the Celtics came on top 95-91. The Celtics are coming off of a surprising loss to the Detroit Pistons last night while the Bulls are coming off of an easy win over the Sacramento Kings. The Bulls are likely to be without both Richard Hamilton and Derrick Rose. Rose has missed the last four games with a back injury. With Derrick Rose out, C.J. Watson, Carlos Boozer, Joakim Noah, and Luol Deng have all taken over bigger scoring roles. The Bulls are 6-2 this season when Derrick Rose does not play. For the Celtics, Kevin Garnett, Mickael Pietrus, and Jermaine O’Neal are all day-to-day, while Brandon Bass is out until after the All-Star break with swelling in his knee. Both Pietrus and O’Neal played last night. Kevin Garnett sat out last night with a hip flexor, although Doc did say that he looked great in the morning shootaround. The Celtics are 4-5 on the road this season while the Bulls are 10-1 at home. If the Celtics are to win, expect Rondo to have another big night. He had 35 and 32 points in the last two games while pushing the pace for the Celtics to create somewhat of a new identity for the team. 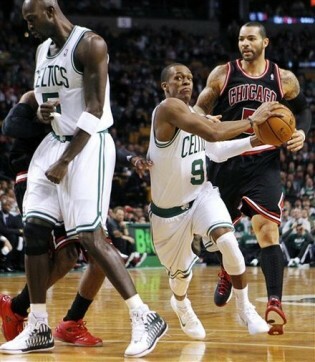 Tune in at 8:00 tonight on TNT to watch the Celts take on the Bulls. This entry was posted in Celtics and tagged allen, basketball, Bass, boston sports blog, Bulls, celtics, kevin garnett, kg, noah, oneal, pierce, pietrus, tnt by leibo4. Bookmark the permalink.